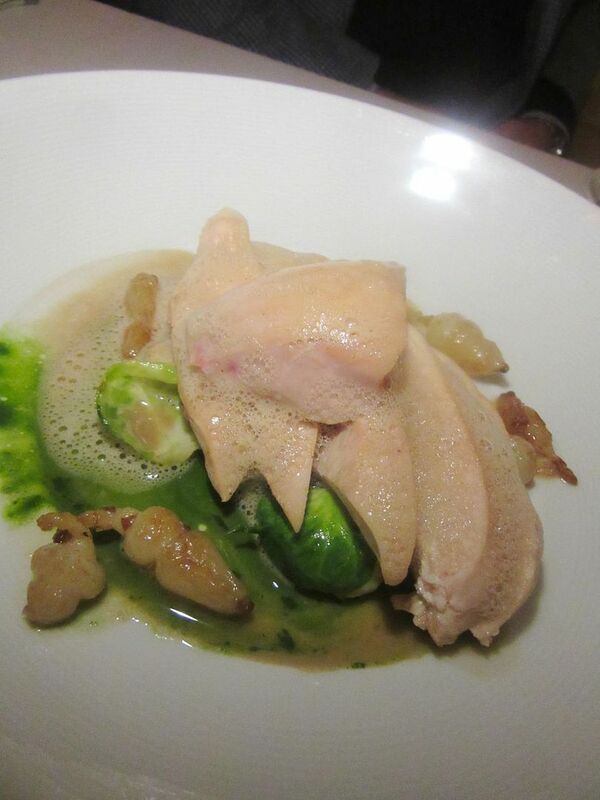 Once the hay-scented chicken has been liberated from its cocotte, the kitchen tends to slicing. When David Bouley announced he was relocating, closing but not closing, downsizing and taking a junior year abroad before or after some scholarly attendance at Harvard to focus on nutrition, Bouley buffs knew it was over. Or could be over. Or was probably over. This innocuous-seeming little smoked salmon amusement has me swooning. 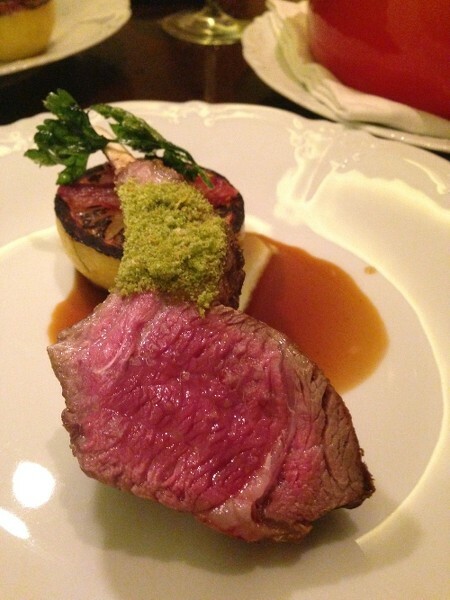 That’s why I called Bouley myself to seek a table Saturday night after bombing out with the reservationist. Bouley is startled. We are both surprised to be actually speaking to each other and about such a mundane detail. “You’re totally booked,” I start. “I called hoping there might be a table you are saving for friends.” Indeed, there was. The scent of aging apples assails you in the entry and then orchids crowd the parlor waiting room. I enlist my friends, architect Richard Bloch and his wife Hiroko, occasional Bouley fans, celebratory diners now and then over the years. He orders a $135 Beaune, a serious wine -- round and ready to drink, the sommelier agrees -- equal to a serious farewell. We’ve chosen the $135 three-course dinner. The bread-trundler wears black gloves to wrestle and slice the table’s choices. How greedy can I be? 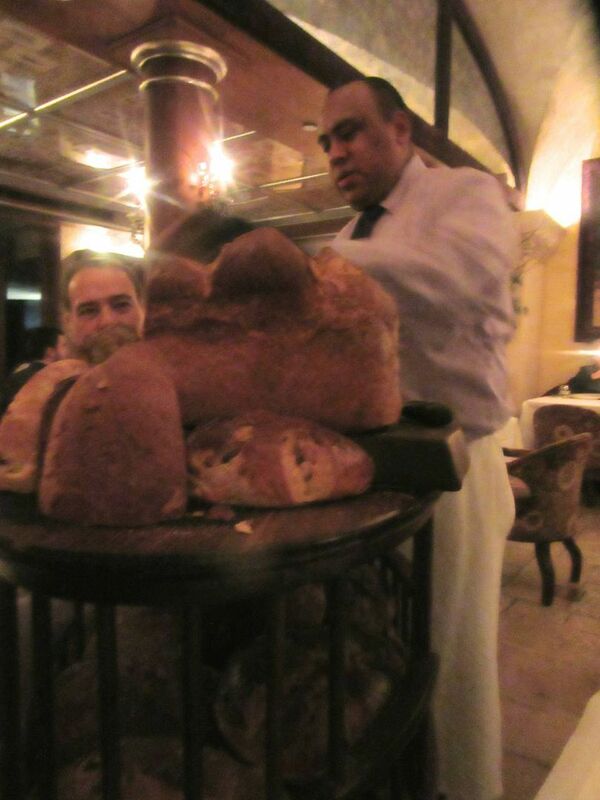 The bread passer lets us choose from a dozen options to start and sets a duo of butters on the table. He cites the origin – handmade, salted, from Normandy -- though not the cow’s name. There are delicate cheese puffs. 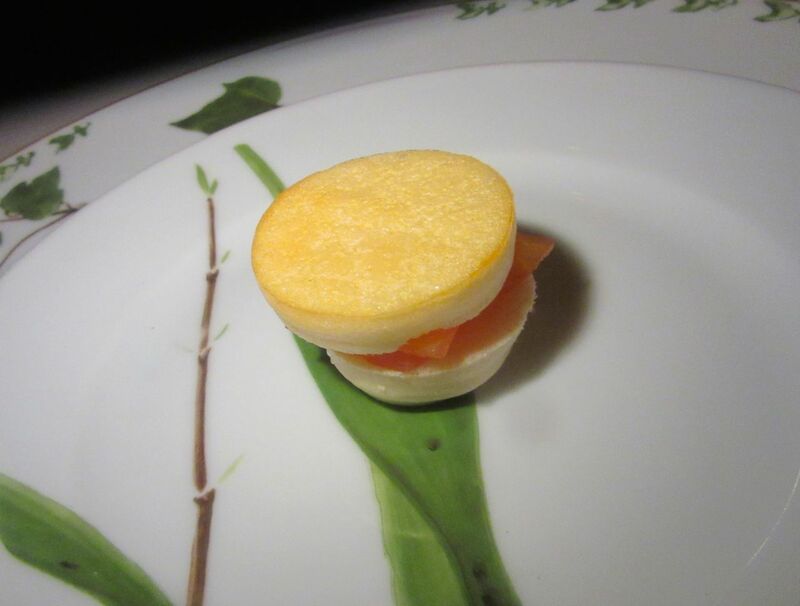 And an ethereal little tuffet filled with smoked salmon on an especially beautiful plate. “Smoked apple blini,” the waiter says, “One bite. Take it in your hands.” I gasp, shocked, as the carrier seems to melt in my mouth to magnify the saltiness of the fish. 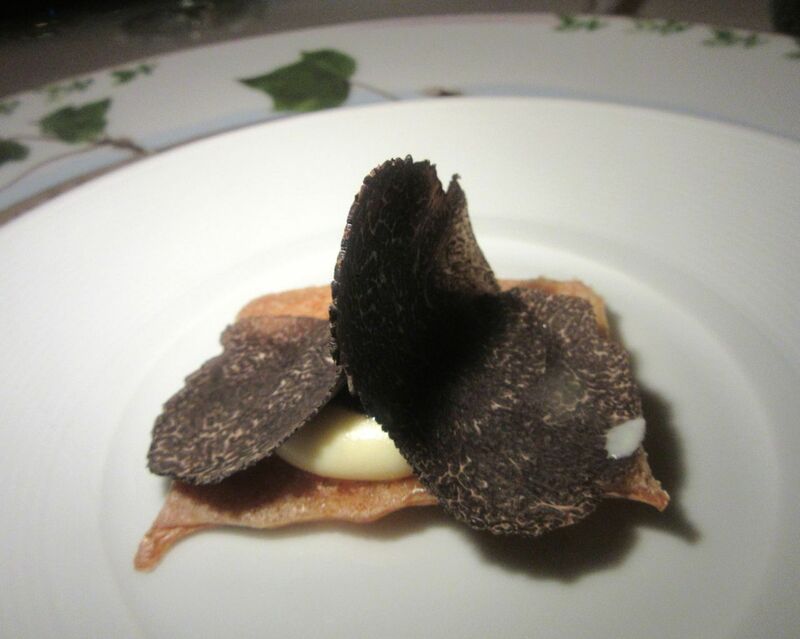 Curls of fresh and highly aromatic black truffle hide a smidgen of wagyu in a nest of sticky-cheesey Aligoté. Black truffle curls hide the Japanese wagyu planted in sticky Aligoté potato purée on a Japanese wafer – a teeny flavor bomb we are ordered to pop that needs to be examined and savored. The Santa Barbara sea urchin floats on homemade tofu soy cream and yuzu panna cotta. 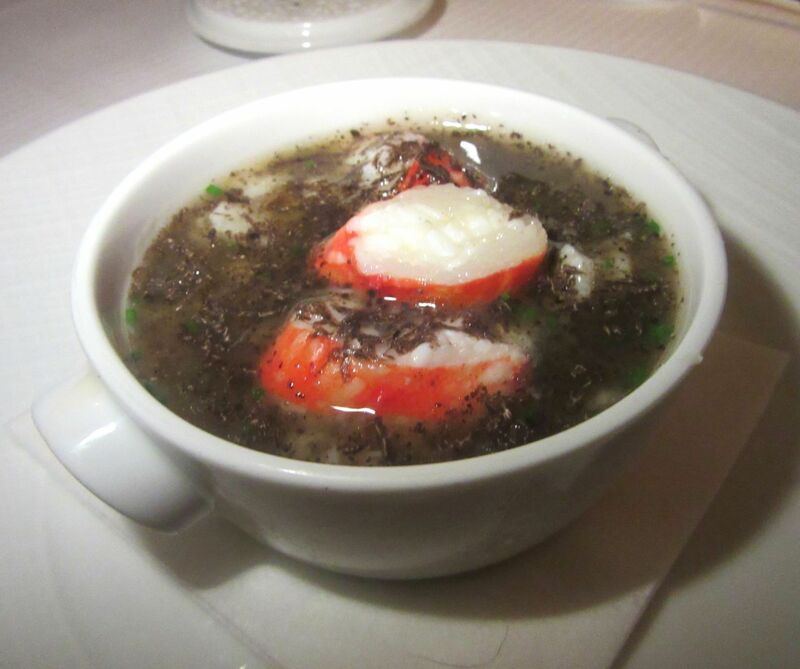 This exotic lobster in black truffle dashi is another gift from the kitchen leading up to the three-course menu. That’s Granny Smith apple mousse with golden Osetra caviar and so many other tastes in a little glass bubble dish. “Reach down with your spoon so you can get all the layers at once,” we are instructed. Of course, I wanted this last supper. Even if Bouley wanders into scholarly asceticism, forsaking his lush history, we needed this last indulgence. I arrive early. I step into the overwhelming scent of apples lining the vestibule, enveloping me at once into the chef’s fantasy. 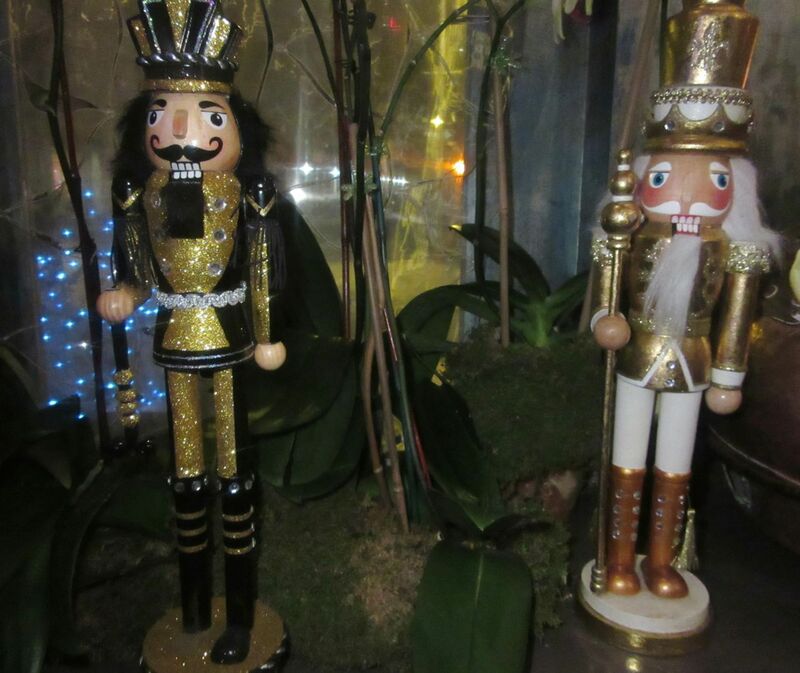 There are still Christmas lights and Bouley’s nutcracker collection among the orchids in the parlor. Inside, I discover Jacques Le Magueresse, familiar face from Le Bernardin, now welcoming the last determined crush at Bouley. The parlor is still dressed for Christmas with strings of lights and David’s collection of nutcrackers -- including a chef in tall toque, holding a gingerbread cookie -- scattered among the orchids. I’ve scarcely settled into a velvet slipper chair across from the giant iris on the wall when the Blochs arrive. 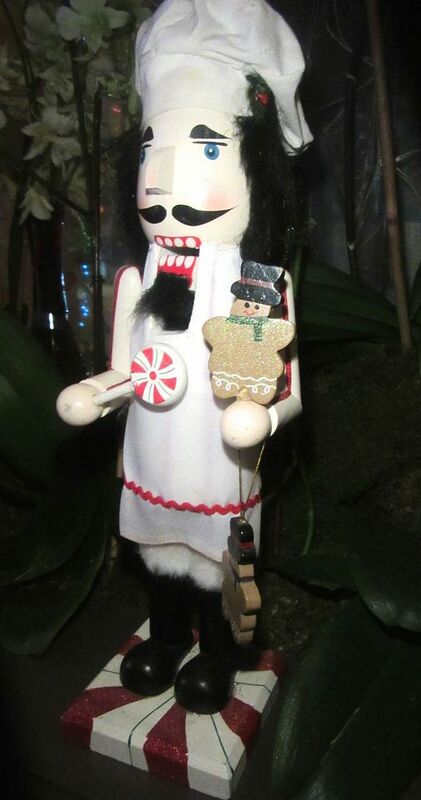 The colorful folk art nutcrackers are all different. I especially covet the mustachio’d chef and this duo. We’re deposited at the same table as the last time I came for dinner. Was it five years ago? 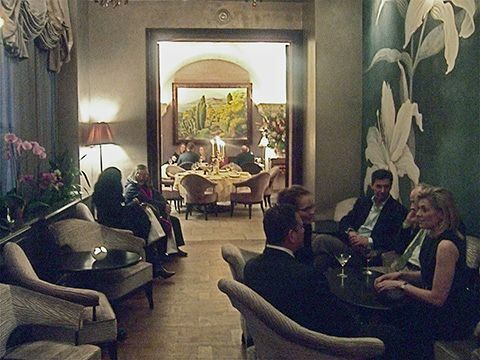 I’m guessing this must be a view Bouley likes: The room is crowded with velour chairs and many large paintings stuffed under low vaulted ceilings -- gold leaf frames, gold leaf ceilings. 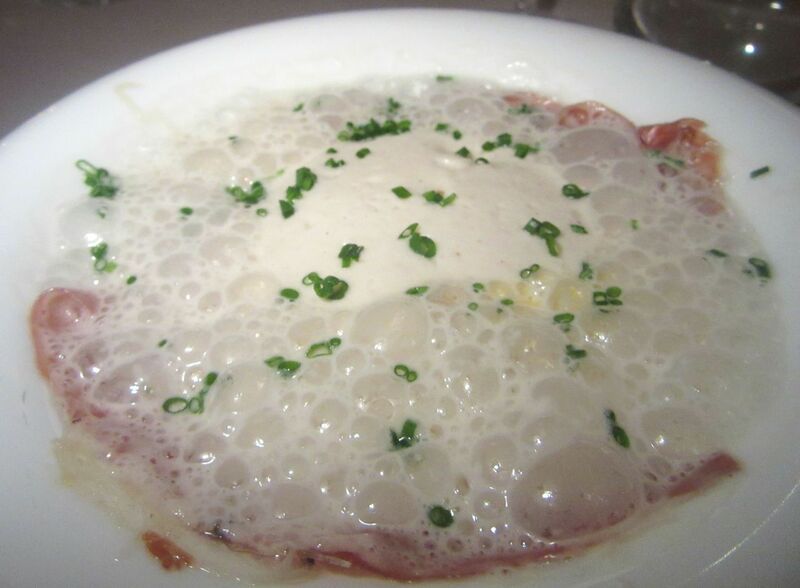 Under this organic foam and its farm egg is ham Iberico, steamed polenta, sunchoke and coconut-garlic broth. The driver of the bread chariot arrives with the collection baked from recipes gathered years ago by a Meilleur Ouvrier de France baker -- more than a dozen loaves, including a brioche as tall as a year-old baby stood on end, and a duo of gluten free inventions. Of course, I want to taste them all and take home what I don’t finish. So many grains, all those berries and cherries and olives and nuts. 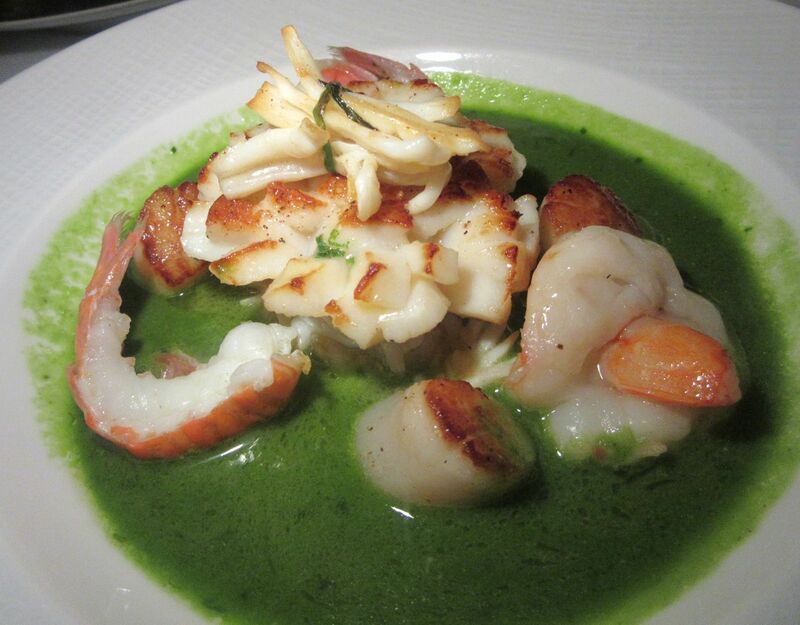 A collection of sea creatures -- shrimp, scallops, crab and calamari -- float in an herbal ocean broth. At last, our first course arrives. My organic Connecticut farm egg with black foot Iberico ham on steamed polenta with sunchoke and coconut-garlic broth bubbles as if alive until I smash the yolk and down a spoonful. Hiroko passes me her dish: North Carolina pink shrimp, Cape Cod sea scallops, Alaskan Dungeness crab and Point Judith calamari, a sumptuous gathering in an herbal ocean broth. 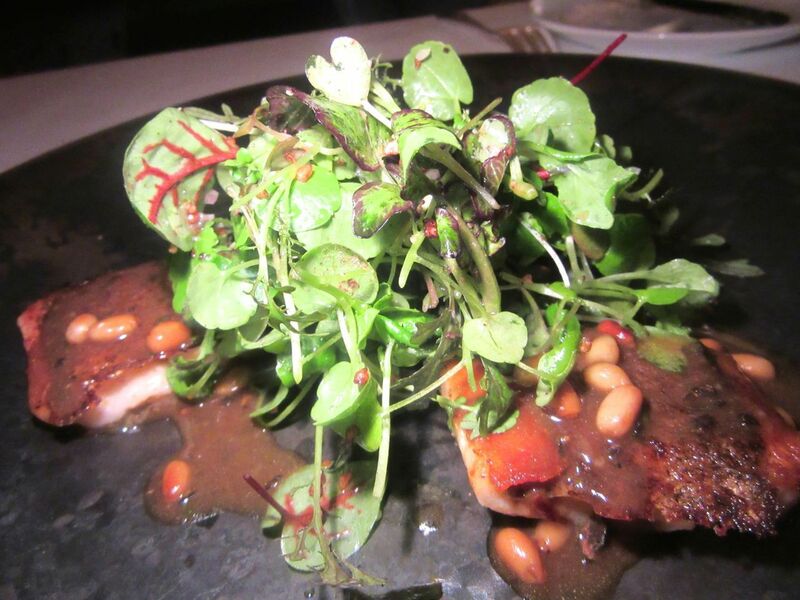 Pine nuts, wild currants and baby watercress garnish Bouley’s New York State Rainbow Trout. I remember when Bouley first turned his menu into an international Baedeker, inspiring a parody in the New Yorker. These days, we just chalk up a few place names to market enterprise. To me, nothing he does seems that affected now that he’s gray and sliding out of town. He stops by our table. I tell him how much I love his nutcrackers. “They’re hard to find,” he says. I want to tell him he’s blocking the return of the grain guy, but I don’t. “We have wild Alaskan salmon tonight,” he says. Steamed chicken bows in three acts. Here it is locked in its cocotte. 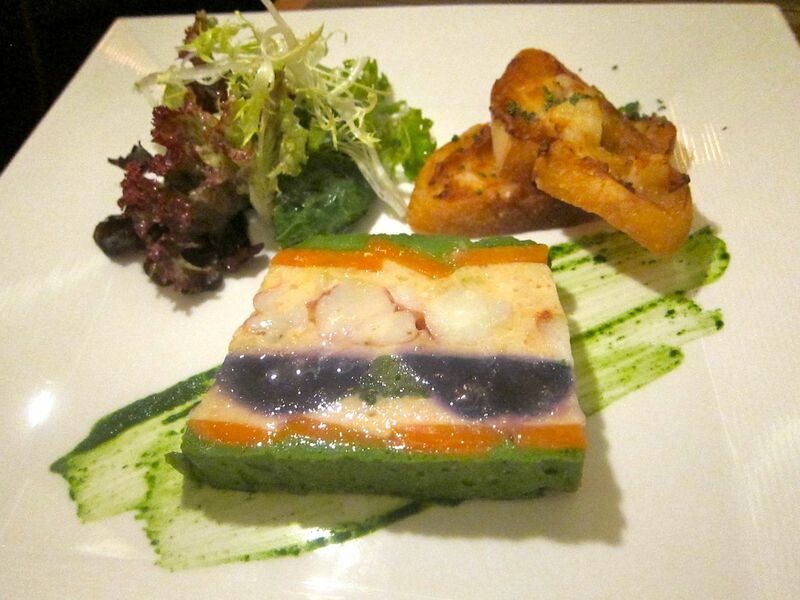 The porcini flan with two kinds of crab in black truffle dashi comes around, pleasantly exotic, especially compared to the slightly stodgy rainbow trout with pine nuts, wild currant and watercress. More gifts from the kitchen interrupt our choices – foie gras for the men, Hawaiian hiramasa with fresh passion fruit for the women. When our captain pries the cover off the sealed vessel, the bird is revealed, plump and pale. Tables are turning around us. Tall women in black fill the aisles. Bouley makes the rounds. Perhaps, these are regulars and he is saying goodbye. The waiter sets an earthenware oval on the table. He breaks the bread seal. A waft of alfalfa and clover hay hits our air stream. 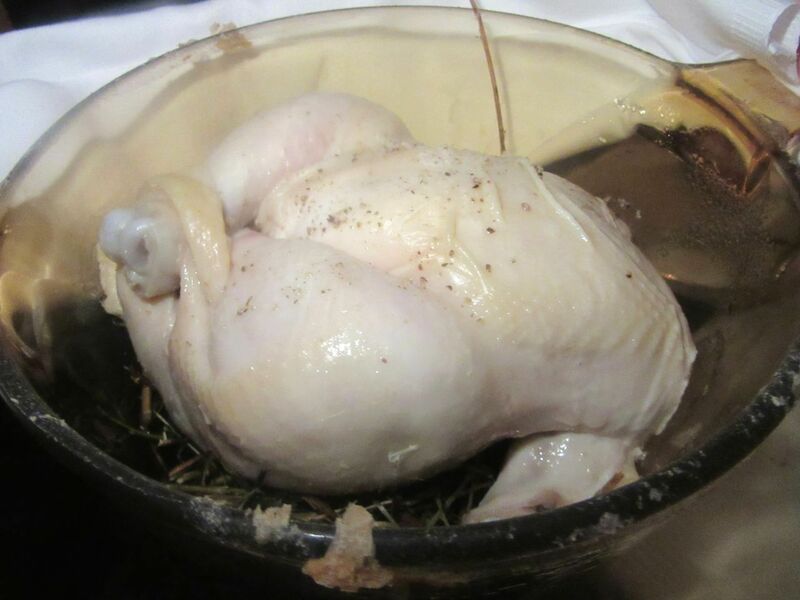 It is the pale, steamed chicken en cocotte. 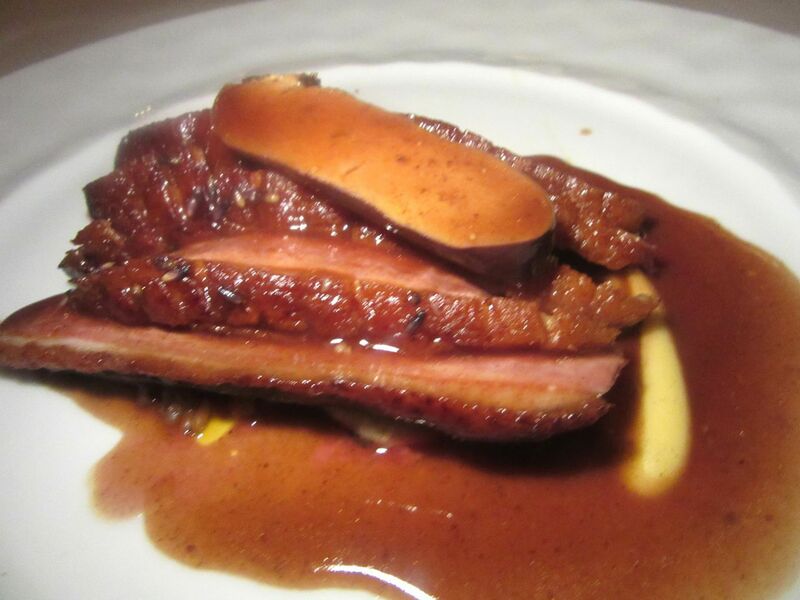 Thick slices of duck breast and a cutlet of foie gras are braised in red Burgundy. Possibly something comes in between, memory wavers. 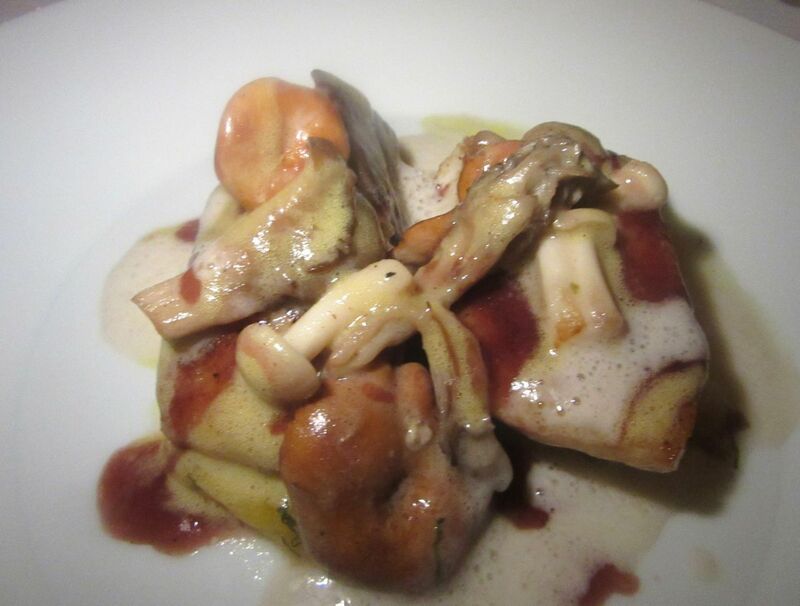 But yes, at last, slices of the firm, voluptuous bird are served alongside chanterelles and big beans. “Franka’s wild beans,” the menu says. I’m sure the waiter could tell us the story of Franka, so I don’t ask. Wild Alaskan salmon with coconut, kaffir lime and black sesame. I’m engaged with the duck and a small, overcooked scallop of foie gras. 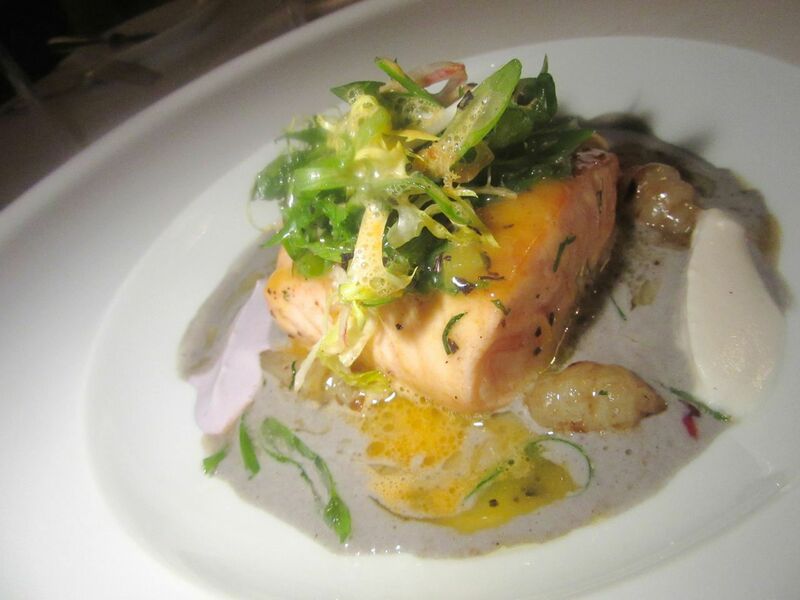 The wild Alaskan salmon with coconut and kaffir lime is better than the black sea bass with roasted pumpkin seed sabayon and a cider sauce. 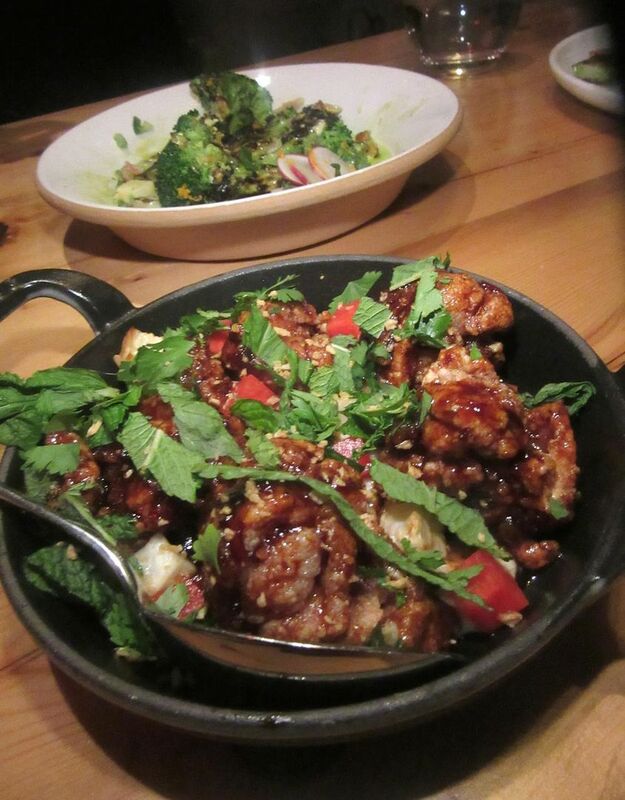 Indeed, the entrées seem ordinary after the exquisite seduction of starters. Black sea bass with roasted pumpkin seed sabayon and spice kabocha squash sit in a tide of cider sauce. We’ve been sitting so long I wouldn’t be surprised to see spider webs. 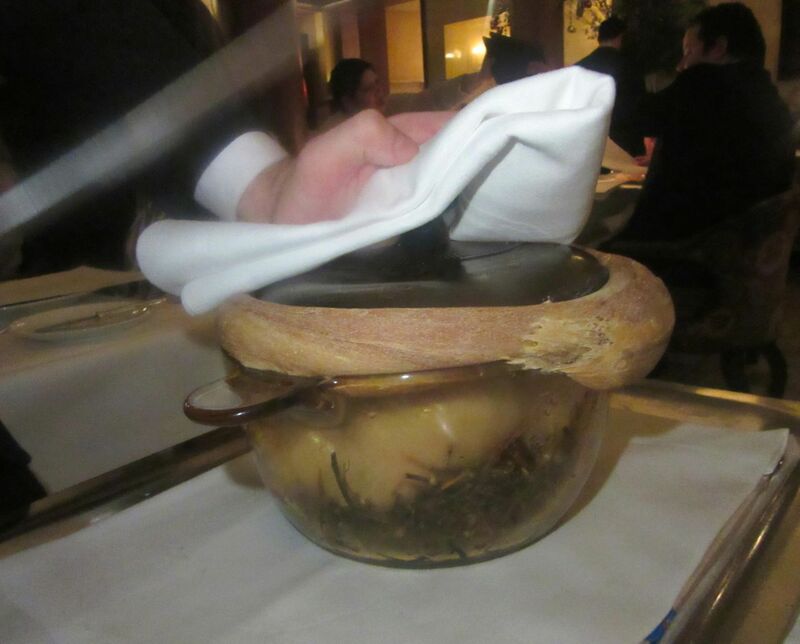 I shall probably never recall great meals at Bouley’s without remembering the long, dragged-out deliveries. Did the cranberry hibiscus sorbet come first? Or was it what the waiter delivers with a weary, “And this item is the white chocolate cloud.” White chocolate and nitrogen foam, two of my least favorite things. 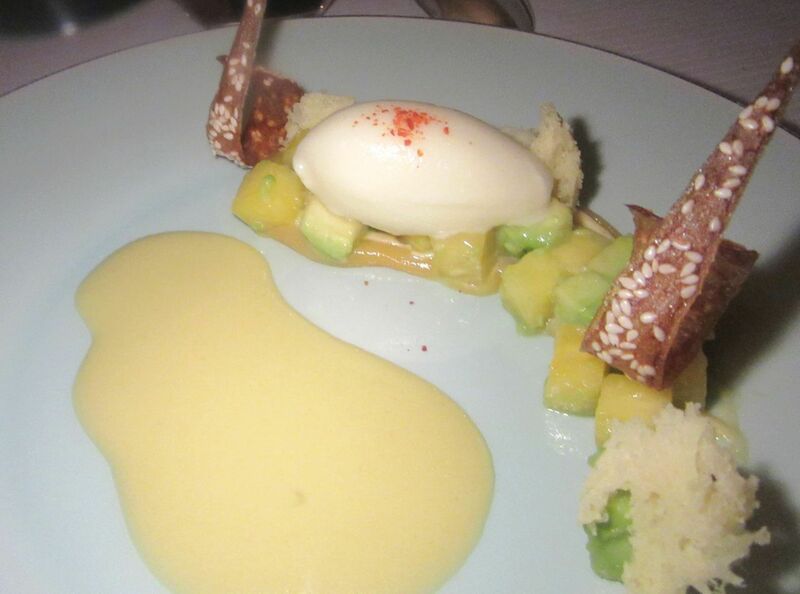 Pineapple-wasabi sorbet comes alongside fresh avocado, miso sponge cake and sesame tuile. Coconut sorbet with passion fruit gelée, lemongrass and 70% chocolate soy milk ganache makes the rounds too, along with a mille-feuille of dulce de leche standing on end. Is that deliberate? Usually a mill-feuille lies horizontal and not vertical. Pineapple-wasabi sorbet with fresh avocado and a sesame tuile would not be my choice. I share my Frivolous. It’s chocolate with coffee gelato. 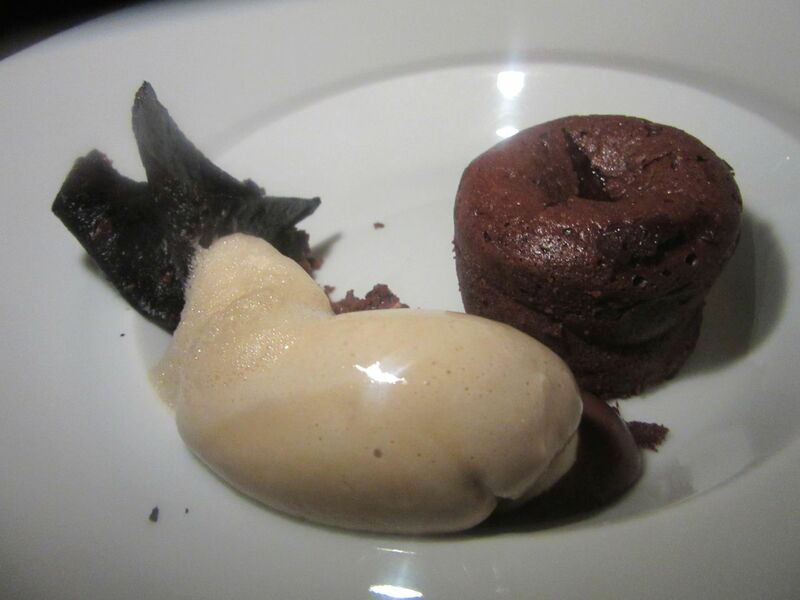 The house calls this chocolate confection with coffee gelato “Frivolous.” I call it essential. I’m remembering the long-ago lunch at the original Bouley where I sent warnings to the kitchen I had to be finished by 2pm. With the mignardises the house always delivered a small chocolate mouse. “It’s after two o’clock,” I called out to David, standing across the room, throwing the mouse at him. Tonight, I’m sad to see we’ve outgrown the mouse. Of course, I’m not the firecracker I used to be, either. 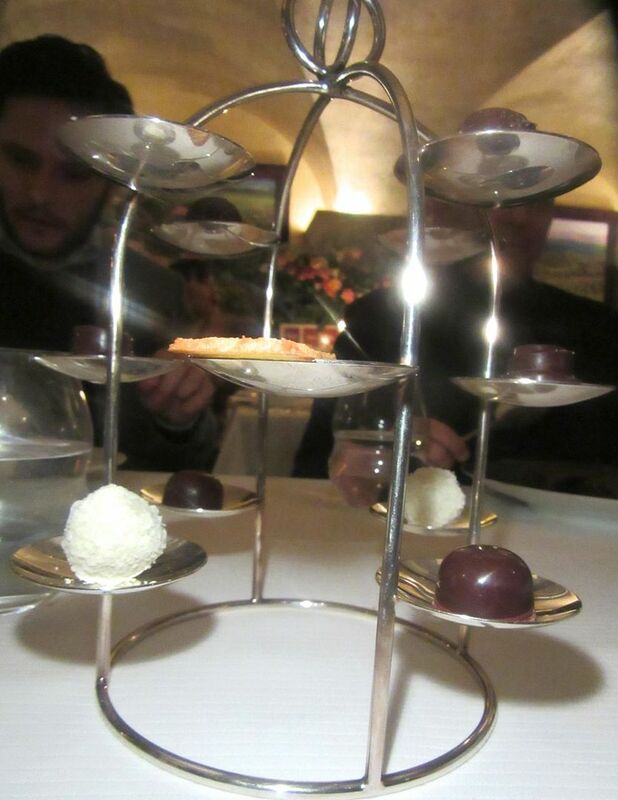 Surely, Bouley’s pastry department can do better than this meager goody tree. I miss the chocolate mouse. 163 Duane Street between Greenwich and Hudson Streets. 212 964 2525. Lunch Monday to Saturday 11:30 am to 2:45 pm. Dinner Monday to Saturday 5:30 pm to 11 pm.